The Alabama Research and Development Incubation System has been designed to provide optimal oxygenation and nutrient delivery to tissue slices in organ culture and to minimize damage and facilitate handling of the slices during preparation. Slices (e.g., liver, kidney, heart, brain, etc.) are easily loaded onto specially designed titanium screen holders by a tissue slice loader that eliminates the use of slice-damaging forceps or spatulas. 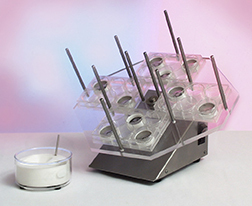 The loaded slice holders are transferred to standard tissue culture six-well plates which are rotated (1 rpm) on an inclined plane to alternately expose the slices to the atmosphere of the tissue culture incubator or dip them in the culture medium. Reusable autoclavable titanium screen slice supports in delrin holders (biologically inert). Fast, easy, non-damaging loading of slices onto their supports using AR&D Tissue Slice Loader. Uses standard tissue culture six-well plates. Up to 24 plates (144 wells) per run. Alternate exposure of slices to atmosphere and culture medium. Inclined rotator fits inside most tissue culture incubators (15" x 15" x 15" or larger).